GE Silos manufacture a range of custom built silos for the grain and livestock industries. This March and April will see GE Silos attending trade events in both Warragul and Bendigo to exhibit a number of their products. The first event GE Silos will attend is at Farm World which takes place at Lardner Park, Warragul on the 21st-24th March. The Victorian Pig Fair, will be held at the Bendigo Exhibition Centre on the 16th-17th April will also see GE Silos representatives present. 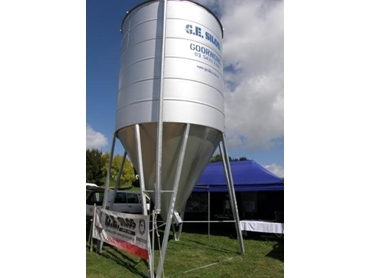 Specialising in pellet, grain, feed & seed, elevated and superphosphate silos, GE Silos will also be showing you the “Mini G” which is a smaller, more scaled down silo and will be filled with all types of different sweets and goodies for the kids. All GE Silos are manufactured in Australia and with being custom built to client’s requirements; both of these events are good opportunities to ask any questions you may have about the silos.